It’s good to be home. Time on the road isn’t bad -- the racing is fun to watch, the food’s OK, the rooms are warm. But there’s nothing like being home with family. It’s been a while since I made a post here. Between chasing races in Canada, coming home to prepare for Christmas, and working with our ski team at Schweitzer every day, life has been rather hectic. So I’m using Christmas afternoon to catch-up on stuff. Scott’s December race results weren’t what he’d hoped for, but he’s far from beaten. He knows he’s skiing well and the final two tech races left him encouraged. I’m actually quite impressed with his self confidence and motivation. Of course, a number of his teammates and friends continued to race after the NORAMS, at regular FIS races in Canada and Colorado, where the point opportunities were better. Several scored good FIS points, which left Scott feeling left out. He wasn’t aware that the option existed and thought time off in his schedule to be mandatory. He’s lamenting the points he might have pursued. I, on the other hand, see these two weeks at home to be important. We’ve been on the road for 9 weeks. No matter how strong and healthy he feels, travel takes its toll… subtly. When Scott flies out Jan 1st, he’ll be on the road for another 7-8 weeks with about 20 or more race starts before getting home for a few days. So I’ve been paying attention to keeping him focused on the schedule ahead, not the missed opportunities. 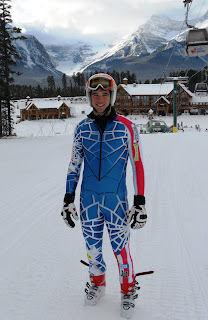 The NASTAR folks asked Scott to be the pacesetter at Schweitzer this winter. By doing so he saved the mountain $1500 in travel expenses, which may very well have saved the program. He donated a few days skiing with the local pacesetters and giving them a chance to get back into the swing of things. NASTAR isn’t exactly a real race, but it’s good fun. It was also fun for Scott to paceset the same guy who was the pacesetter in Scott’s first ever time through gates when he was four years old. Kinda cool! We’ve both been working a little with our home ski team, filling in when the group coaches aren’t available. The younger kids get really excited to have a US Team guy skiing with them, even though they’ve known him for years. Funny to watch. Last night I was watching “We were Soldiers” for the umpteenth time. If you haven’t watched this movie, you must. It’s a classic, embracing family, leaders, and soldiers as they navigate the emotional swamp that is combat. The central thesis of the movie is that soldiers fight and die for each other, not for the patriotic words in a speech. After the movie, my thoughts drifted to all the young athletes here at the NORAM and I saw some parallels. Each of these kids (at age 60 they’re all kids) is enormously talented and has high aspirations. They each arise in the morning with goals and hopes and through the day do everything possible to achieve them. In the course of the day they encounter barriers such as soft snow, late start numbers, difficult course sets and uber-fast competitors that stand in the way of success. They begin the day as focused individuals, they end it as brothers. I watched from a corner of the lodge as racers came in from their first run. Some looked confident and satisfied. It was immediately apparent in others that they were disappointed with their performance. But the preponderance of athletes came in uncertain. Perhaps they’d skied well but their times didn’t reflect it. Perhaps they’d skied great, but had one mistake which yielded a disappointing result. No matter what their circumstances, I watched as this group of individual athletes buoyed and sustained each other. They listened intently to each other’s descriptions of their runs . They smiled and nodded knowingly. There were lots of self-effacing “Me too’s” rendered to sooth the wounds. By the end of lunch, as they were preparing to inspect for the second run -- they were renewed warriors heading to the next battle. So why, in an individual sport where everyone is gunning for each other, do these guys provide each other the support to survive? Why do they invest in each other’s emotional well being and encourage each other to press on? I suspect it’s the shared experience -- the feeling that they’re the only ones that really understand each other and the pressures they face in this mentally challenging sport. It’s a great thing to watch… from a distance. Today's event was a Super Combined, which is a Super G plus one run of Slalom. The racers receive two official results, one being a Super G and the other being the combined times of the two runs (the Super Combined). Scott failed to execute in the Super G portion of the race finishing 38th, which became his start position for the Slalom. The lift broke while Scott was enroute to the start and he sat for nearly 20 minutes. When he arrived at the start he was told that he had time to prepare, then heard the starter yell, "Anyone who's ready come on up and you're in." Scott saw numerous racers behind him in the start order get in line, and rather than lose his sequence and ski an even rougher course, he joined the mob. As it was he started about 10 racers late and he says that he never had a chance to get his mind in the right place before starting. That must be true since he went by me without ever tucking! However, none of that is a valid reason for his performance. He simply didn't execute. Certainly one's mental state is key, but there will be many times when something like this happens. Scott needs to learn to adjust with these situations and develop alternative means for getting into his performance zone when things aren't perfect. There's so much to learn. Scott did ski the slalom portion well and lower his Super Combined points. I was concerned about this since he hadn't been on Slalom skis since Nov 28th. So at least there's a positive to take from this. Racing continues tomorrow! Well, we woke up to fine powder again today -- about 4 inches, and it continued to snow all day. Fortunately the snow started late enough that the workers were able to catch-up and keep up. Course maintenance isn't as simple as it seems. 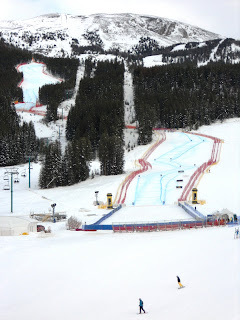 In instances such as last week at Lake Louise, once a storm has the 12 inch head start it's awfully difficult to get a race off. However even seemingly small amounts like the 4 inches today pose a challenge. The snow not only has to be pushed off the race track, but the spill zones (where a racer would end up if he/she missed or was late at a gate) must also be cleared. Suddenly the crew is faced with clearing a 100 foot wide slope, edge to edge and for thousands of feet down the hill. To accomplish this feat everyone gets involved. Coaches and athletes join in the slip and normally the start times are delayed (45 minutes today). Once the track is slipped, the "B" netting is lifted and reset so it is back atop the snow surface. But once the track is open the job isn't done. During the race a steady flow of "slippers" travels down the course between racers, moving and smoothing the snow. Coaches and course workers stand at problem areas with shovels and rakes evacuating that snow broken loose by racers and slippers. As always, safety is the big consideration and this job has to be carefully orchestrated. The crew did a great job today getting the race done. Although the track was softer than we'd like and became somewhat bumpy for the later runners, it was safe. Yesterday I incorrectly quoted a fee a region was charging for the three races in Lake Louise based upon input from another parent. The point I was making was not about the total cost, but about the way each group of us perceives cancellations. My apologies to the region in question, as I know they make every effort to keep costs down in this very expensive sport. I have since corrected the numbers. I was likewise guilty this past week of putting in a direct quote which may have reflected poorly on a coach. I have changed the quote and will refrain from such in the future. This blog is generally intended to serve as a source of information for those friends and family following Scott's progress during the season. I have also used it as a tool to explain the various aspects of ski racing, such as suits, points, netting, etc. The past two weeks have been a bit emotionally challenging and I've imprudently expressed some strong opinions with a parental bias. I will temper my comments in the future. This morning we woke up to 12 inches of beautiful powder. Ten years ago I would have hopped out of bed and been the first in the lift line. But times have changed and today I drove to the slopes before openning to check the status of the race. The decision had already been made (and it was the right one). The athletes were on the hill tearing down the netting as this was the final day of the series. -- The athletes are always ready to go. They've been preparing for months. Each race is an opportunity. Their mental preparation is in full swing the evening prior and by race morning their focus is narrowing. Cancelations are an emotional letdown. -- The coaches are probably the most conflicted by cancellations. They likewise go through months of preparation. They are fully invested in their athletes. They, more than anyone, have a broader view of the opportunities each race presents. However, they are also deeply protective of their athletes' welfare and watch closely to ensure the right decisions are made. -- The Race Committee and Organizers work months preparing to host major events. 95% of the workers are volunteers who have put in the sweat equity to create a viable and safe venue. They are great people and take pride in their work. Most of them either have, or had, ski racers in their family. -- The parents foot the bill. Besides liking to watch the races and see their kids succeed, they've paid some pretty big bucks to get their kid to the events. For instance, one region charged $900 per athlete for this three race event (not including transportation). If one race falls out, the family perceives to have "lost" a $300 investment. But the fixed costs don't change -- that's just the way this sport works and it's actually fair. This is a winter sport and there is associated risk to each race investment. In the end, the difficult decision to cancel a race is made by the Jury, headed by the Technical Delegate. I could write a full blog describing this person's job and responsibilities. Suffice to say, he/she is the final authority at any race and has overall responsibility for protecting our athletes, the workers and the public. The TD also has a full understanding of all impacts this has on each cohort, but he/she makes the decision that best serves the athletes and the sport. Special people. The Team had reserved the rooms through tonight, which was a good move. If the race had gone off the boys would be thankful for a hot shower and a bed after tearing down all of the "B" netting (see explanation below). Last year Scott and I drove late after this race and the netting drill and we were miserable. So anyway, the boys had a full day off. I have no idea what they did, although I heard a Canadian vs US hockey game was on tap. They played one two days ago and the Canadians killed them. Scott loves skating and is really getting into hockey (minus fistfights, thank you). For my part, I had a condo waiting in Panorama. 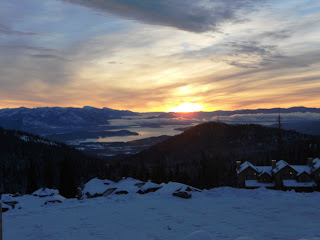 I'll go see my Ski Patrol buddies, pick up my lift tickets, and ski around a while. I want to look at the snow conditions. Looking forward to the next race series. Oh yeah. "B" Netting. If you watch TV and see the triple walls of red netting lining the course, that's "A" and "B" netting. Traditionally the athletes and coaches dismantle and roll all the "B" netting at the end of an event. It's awkward, difficult and time consuming, but part of the deal. Have I said before that there are no great young downhillers? Yes I have. It takes so long to perfect the line and truly learn/internalize these courses. Scott almost had a career day -- but he didn't. Now don't get me wrong. He skied well enough to finish 20 of 99, score FIS and NORAM points, beat the entire US "D" Team and alot of the rest of the team team. However, he didn't win. All week long (and for that matter, last year) Scott has been perplexed by one turn called "Fall Away." This turn requires one to dive towards the protective fence going about 70 mph, stand on the left ski and loop back across the hill and over a knoll and and commit to a right foot turn on a sidehill. The move from the fence to the knoll is a "blind" move. He's given up time there every day, but today he was dead on. I had him ahead of the field 2/3 of the way down the course. I was getting ready for the awards ceremony. However it wasn't to be. He came into the turn at the base of the hill and pressured as he had the first four days, except this time he was going about 20 mph faster and before he realized the problem (1/100th of a second) he was looping wide and the race was over. It took Scott a good 20 minutes to be sociable in the finish arena. He was obviously reliving the 1/100th of a second over and over. He just called me and told me he's alternately pumped and disappointed in the result, but he now knows he can beat all these guys. Now there's something to build upon! Since we're at a speed week, it probably makes sense to explain speed suits in more detail. The need for speed suits is apparent -- this is a game of fractions of seconds and wind resistance is an important factor. When the first speed suits were introduced in the late 1960's, there were no quality or safety controls. Naturally things got out of hand in a hurry, and soon folks were wearing suits so slick that a person actually accelerated if they sat on the ground. Fortunately the FIS got a handle on this and there's now a standard for suits. Every suit worn in a FIS sanctioned event must go through a "plomb" test to determine how much pressure is required to push a measure of air through the fabric. This prevents fabrics from being so slick as to be dangerous. How big is the advantage a speed suit gives? It's significant! As a rule of thumb the difference between a speed suit or regular attire over a 1 minute long GS course is about 1.5 seconds. So everyone searches for ways to make suits faster within the parameters set by FIS. Last year the US had "slippery suits" made especially for the Olympics. These suits supposedly gave a significant advantage over the average stuff. This year the "gig is up" and everyone has access to these suits. Scott is pictured above in this year's US Team suit. But wait, there's more to this. Scott has two different types of suits, padded and unpadded. Athletes never wear pads for Downhill. They sometimes wear pads for Super G and always wear pads for Giant Slalom and Slalom. However, we've learned that the suits with sewn in pads are not as slick as those without, so athletes now wear "stealth" pads under the unpadded suits in Super G and Giant Slalom. OK, enough of that stuff. Today was the first Downhill race of the NORAM season. Scott skied well, except for missing his line in one critical spot. It cost him lots of time so he settled for 12th place of 99 in this elite field. He lowered his FIS points, picked up a nice sum of NORAM Cup points, beat the entire "D" Team, plus earned the Juniors (age 19 and under) bronze medal. His goal tomorrow is to take the whole thing... we'll see. Lake Louise is the site of the opening World Cup downhills in North America each year. First the men come through town, then the ladies, and finally, as long as all the preparations have been made, the NORAM circuit bats clean-up... literally. The final day we get to tear down all of the "B" netting! We live for speed weeks. Although Scott is a four event athlete, speed is truly his forte. He loves the wind in his face and flying off bumps at 80+ mph. We both enjoy the pace. Days are simpler than at technical events. Lengthy inspections, lots of mental preparation, only one run per day, then afternoons of preparing skis for the next race. Everything just seems more layed back. Of course for some people these are stressful weeks, but Scott's so comfortable with speed that this is more like a week at the amusement park. He's skied well thus far in the two training runs. Yeah training runs. The rules require that any competitor completes at least one timed run through the exact course which will be used on race day. They normally schedule two days in case weather intervenes, but this year he got to run both days. Scott's skis are running well. He was fastest through the traps yesterday and today he handily won the final glide split. Tactically there have been some issues. Yesterday he missed his line on a big fall away turn and took a scenic tour enroute to the next gate. It cost him a bunch of time and he finished 39th. Today he fixed that problem and finished 13th... in the hunt. A win or podium here is well within reach if he puts it all together. As I mentioned earlier, mental preparation is a big part of this event. At 80-90 mph there's little time for indecision. Athletes must have the course memorized to the most minute detail. Being a foot off line in some segments might put one into the fence. At a minimum, it will cost precious tenths of a second in a game of hundredths. As a coach, I focus on being positive, sticking to a regimen and helping the athletes create tools for remembering their line. But the most important thing after tactics is doing whatever is takes to help each athlete get into the proper frame of mind for the race. It's late, I'm tired and I'm a little fed-up. That said we're in beautiful Lake Louise, Alberta for a week of Downhills and Super G. What could be better. Rather than labor through the mechanics of ski racing today, I thought we'd do something a little more light hearted. We're staying at the Hostel in Lake Louise – not the Ritz, but its restaurant is one of the best kept secrets in this town. Staying at the Hostel also brings us in contact with a variety of international travelers. Last night Joy met a Japanese guy, here for the races, which appeared to be subsisting on a jar of peanut butter. She invited him to join us for dinner tonight. Takeo Ubukata is a ski technician from Tokyo, the only skier in his family, and a passionate ski racer. He’s 34 and living the dream. He hardly speaks English so it took hours to obtain his story. He says that in Japan it’s impossible to become a downhill racer because the slopes are all so crowded, so they only train slalom on narrow lanes. He decided he had to race downhill, so saved his money, bought some old downhill skis, and headed over here. How he got on a NORAM start list I’ll never know. While inspecting for the first training run today he was very scared. He wasn’t sure he wanted to run the course. While side slipping down the icy pitch, one of his ski edges ripped out from his ski. When he got to the bottom he decided he’d come this far so he’d better give it a shot. So he switched his skis to the opposite feet so the ripped edge was on the outside and headed to the start. 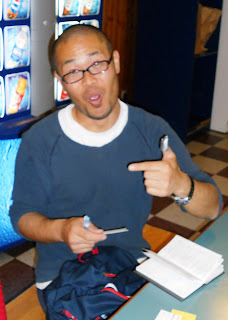 As he told his story in broken English and hand gestures, his excitement was palpable. He triumphantly finished 89th of 99 competitors. But it’s not over... He’s found some used Super G’s for sale in Banff, so will go there tomorrow to pick them up. He says he can’t afford two sets of skis, has had enough of going 85 MPH, and will just do the Super G’s here and at Panorama next week. So we've adopted him, will feed him again, and will set-up his race skis for the Super G races. You gotta love this guy!